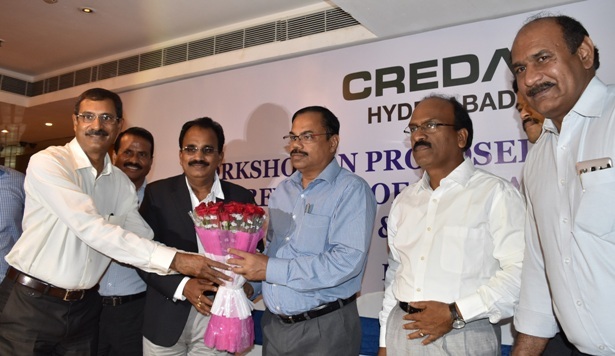 Hyderabad August 2016 – The Confederation of Real Estate Developers’ Associations of India (CREDAI) Hyderabad, the apex body of private real estate developers in Hyderabad is organizing a Workshop On the Proposed Integration and Revision of HMDA Masterplan – Issues and Challenges. The Proposals of Integration of different Master Plans and Revisions thereon will be presented by Sri T Chiranjeevulu, IAS, Commissioner, HMDA, and by Lee Associates. Dr. B. Janardhan Reddy, IAS, Commissioner, GHMC and Sri N. V. S. Reddy, MD, Metro Rail are also participating in the discussion and present their views on the subject. Directors and senior officials from HMDA, GHMC and HMWSSB are invited to participate in the Workshop to throw light on the Subject Matter. Experts from Town Planning, Master Planning, Architects, Real Estate Developers were present to deliberate in depth on the Master Plan Proposals. At the recently concluded CREDAI property Show, Hon’ble Sri K. T Rama Rao – Minister for IT, Industries, MAUD and NRI affairs, Telangana expressed the need to integrate the 5 existing masterplans for the city and develop a comprehensive master plan for the city, incorporating the need for the development of Transit Oriented Growth Corridors and the development of the region around ORR and beyond as a measure to transform Hyderabad into a global, smart and livable city. Taking the cue from the observations made by the Hon’ble Minister, CREDAI Hyderabad has taken initiative to conduct the Workshop. In this connection, Mr. S. Ram Reddy, President, CREDAI Hyderabad expressed the view that thanks to the slew of reforms ushered in by the Hon’ble Chief Minister Shri K. Chandrashekar Rao garu, in the form of TSiPASS – a path-breaking and revolutionary Industrial Policy, a comprehensive IT and ITeS Policy, an innovative Startup initiative, the T-Hub, and Reforms in Real Estate Sector in the form of simplifying the Building Rules, removing certain bottlenecks in them and increasing the “Ease of Doing Business” through transparency, accountability and Online, Single-window Approval System have fueled the economy to higher momentum and growth. The State is making rapid progress and Telangana is now ranked as one amongst the best states for doing business due to the proactive policies and quick decision making in the State administrative machinery. Further Mr. G Ram Reddy, President CREDAI Telangana added, “Hyderabad is one of the preferred IT destinations for multinational companies and research and development centres. We are greatly inspired by the vision of our progressive and dynamic leaders to make Hyderabad a global city and Telangana the most sought after state in the country. Hyderabad alone employs over 3,20,000 people working directly in the IT, ITeS sector with an output of US$74 billion contributing 12% to the IT exports of the country. Adding to this Mr. P Ramakrishna Rao, General Secretary, CREDAI, Hyderabad said “The initiatives by the government to attract investments and improve the ease of doing business in the state, will go a long way in making Hyderabad a truly global city. There is a regular flow of applications for setting up industries in the State, which has seen investment approvals to the extent of 25,000 crores in the last financial year. City requires a comprehensive master plan for the city capturing the details of drainage, water and sanitation, roads and transport with traffic flows, electricity and drinking water supply, telecommunication and optical fibre network and the future infrastructure required by the city etc. We at CREDAI have taken this initiative to organize the workshop to discuss, debate and collate the issues and challenges to develop an integrated masterplan for the city and will present the same to the government to help prepare a comprehensive master plan for the city, which in turn will further streamline the guidelines and smoothen the approval process in Hyderabad. According to Mr. Ramachandra Reddy, General Secretary, CREDAI Telangana, “Last 2 years, since the formation of Telangana State, we have seen a lot of proactive measures being taken by the government making the state one of the best managed states in the country. Hyderabad city has a cosmopolitan population of approx. 10 million which will probably double over the next few years when the corporates start and enhance the operations in the city. Even the 158 Km 8 lane ORR with the established radial road network will house the proposed Transit oriented growth corridors, needing to be developed as self-sustained townships. The Confederation of Real Estate Developers’ Associations of India (CREDAI) is the apex body for private real estate developers in India. CREDAI represents over 11,500 developers through 157 city chapters and 23 state federations. AP. Its numerous initiatives and activities help developers come together and work towards better practices, improved customer service and a stronger realty industry.